When southpaw Gervonta Davis makes his initial WBA “super” junior featherweight title defense on February 9 against three-division champion Abner Mares live on Showtime from The StubHub Center near Mares’ native Los Angeles, the 24-year-old Baltimore native looks to emulate the beat-down his promoter and mentor Floyd Mayweather inflicted on Arturo Gatti in June 2005. In a 140-pound clash billed as “Gatti versus Mayweather: Thunder and Lightning” and contested before a pro-Gatti, sellout crowd of 12,675 at Boardwalk Hall in Atlantic City, “Pretty Boy” floored Gatti in the first round on the way to earning his third WBC crown in as many divisions by sixth-round stoppage. Mayweather out-punched Gatti by more than 4-to-1 (168-to-41), doubling him over with body shots. His right crosses, left hooks and uppercuts swiveled Gatti’s head like a bobble-head doll, turning frenzied chants of “Gatti, Gatti” into abrupt silence, and “Thunder’s” face into a swollen mess. “I study [Mayweather’s] career and how he adapts to whatever is in front of him. For this fight, I’ve actually been watching ‘Pretty Boy’ Floyd.’ You know what fight I look at for this fight is him versus Gatti,” said Davis to a group of reporters in a recent interview captured by Barbershop Conversations. Four-division champion Adrien Broner introduced Davis to Mayweather. “[Davis] is special. There will never be [another] Floyd Mayweather. We built Floyd…” said Mayweather Promotions CEO Leonard Ellerbe to Barbershop Conversations. A 20-year-old Mayweather’s eighth-round TKO dethroned WBC 130-pound champion Genaro Hernandez in October 1998, his 18th victory being “Chicanito’s” second loss following a sixth-round TKO against Oscar De La Hoya (September 1995) and making “Pretty Boy” the first U.S. 1996 Olympic product to win a crown. A then-22-year-old Davis dethroned switch-hitting IBF 130-pound titleholder Jose “The Sniper” Pedraza by one-knockdown seventh-round stoppage in January 2017, becoming America’s youngest-reigning titleholder in his 17th fight, the second-youngest world champion from Baltimore and the first from his hometown since Hasim Rahman won the heavyweight championship with a stunning knockout of Lennox Lewis in April 2001. Davis traveled to London in May 2017 for his initial IBF defense by dropping and stopping southpaw Liam Walsh in the third round, but Davis lost that crown at the scales in August 2017 before scoring a one knockdown eighth-round knockout of Francisco Fonseca. Pedraza, Walsh and Fonseca were a combined 62-0-1 with 39 before falling to Davis, who ended Fonseca’s five-fight knockout streak. Pedraza lost for the second time on December 8 at 135 pounds by unanimous decision to left-handed three-division champion Vasyl Lomachenko (12-1, 9 KOs), who twice floored “The Sniper” in the 11th round, adding Pedraza’s WBO crown to his WBA version. Pedraza had won three straight 135-pound bouts after Davis, and withstood a 40-plus punch 11th round by Lomachenko, a 30-year-old two-time Ukrainian Olympic gold medalist. In October 2012, Pedraza improved to 11-0 with seven knockouts following a seventh-round TKO of left-handed then-late replacement Tevin Farmer of Philadelphia. On December 15, Farmer (28-4-1, 6 KOs) earned his 21st consecutive victory and second IBF title defense by unanimous decision over against Fonseca (22-2-1, 16 KOs), who was after his fourth straight stoppage victory since losing to Davis. A compact, 5-foot-6 fighter, Davis has returned to career-long trainer and father-figure Calvin Ford, who served as an assistant to Kevin Cunningham for his victory over Fonseca on the undercard of the Floyd Mayweather-Conor McGregor fight. “Skill-wise, I think Pedraza was the hardest guy I’ve fought. 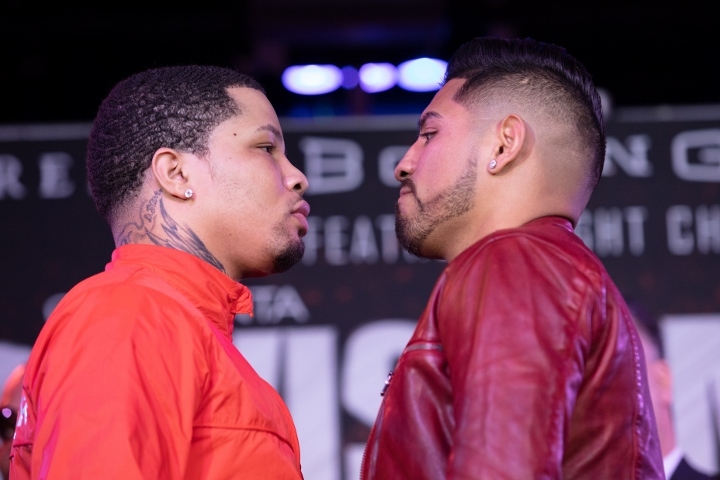 This [Mares] is a big fight for me because this is my first time being a main event in the U.S. and I just feel blessed to be here,” said Davis, who was given the nickname, “Tank,” by one of his trainers for his large head. Davis became a two-time champion with April’s title-earning two-knockdown third-round TKO of fellow southpaw Jesus Cuellar (28-3, 21 KOs), of Buenos Aires, Argentina, and pursues his 12th straight knockout against Mares, a 33-year-old making his 130-pound debut on the eve of Sunday night’s 61st Grammy Awards at the Staples Center in Los Angeles. “I don’t know what Abner sees, but he was sure he wanted to take this fight so obviously he sees something. I have power, speed, movement and really a blend of everything. I believe I’m a better fighter than him,” said Davis of Mares, whose native LA is less than 30 minutes from Carson.